The Gagudju Crocodile Holiday Inn is a unique crocodile shaped hotel building in the World Heritage listed Kakadu National Park, near Darwin, Australia. The 250 metres long (head to tail) hotel has a belly width of 40 metres. The entrance, foyer and the reception area along with the restaurants are located within the jaws of the crocodile and the 110 guest rooms are located in the trunk and tail of the crocodile. The courtyard contains a swimming pool shaped like a crocodile's heart. 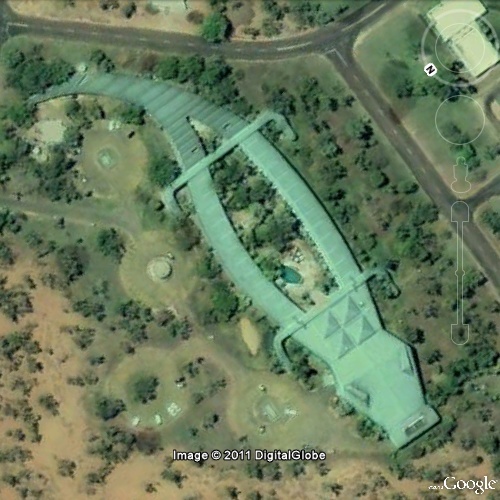 The giant crocodile was designed by a Darwin architect, John Wilkins in consultation with the the local Aboriginal people - Gagudju. Giant crocodiles, which are found plenty in the region, are of great cultural significance to the Gagudju. Now, this is one of the weird kind of hotel. I would like to stay at this hotel, when I do visit in Australia near in future.